I looked at all end of the season props in my Week 10 story last week, so really no need to recap those since there wasn’t a resolution to any of them. So let’s get right to a few Week 11 specials that Bodog offers. First off, let’s look at a few Super Bowl prop bets for Super Bowl XLVI. The Green Bay Packers, who improved to 9-0 with a Monday night thrashing of Minnesota, continue to get shorter odds. The Pack opened as the second-favorites to win the Super Bowl in the preseason, behind New England, at 7/1, but are now all the way down to 2/1 – they were 5/2 before Week 10. It seemed people were off the New England bandwagon following back-to-back losses as the Pats (11/2 in the preseason) were up to 7/1 entering Week 10 but are back down to 11/2 following their impressive 37-16 beatdown at the Jets on Sunday night. The Eagles, if you are wondering, were 15/2 in the preseason and are now all the way up to 50/1 after Sunday’s shocking home loss to Arizona dropped Philly to 3-6 and all but out of playoff contention. And one interesting move was Houston, which crushed Tampa Bay last week, has won four in a row and is in a battle for the No. 1 overall seed in the AFC. But the Texans’ Super Bowl odds dropped from 12/1 last week to 16/1 this week. That, of course, is due to the season-ending injury to QB Matt Schaub. Bodog has opened the NFC as a three-point favorite for the Super Bowl. I’m taking that right now. The other big quarterback news out of Week 10 was Kansas City likely losing Matt Cassel for the season due to a hand injury suffered in Sunday’s 17-10 loss to Denver. Tyler Palko takes Cassel’s starting spot with the Chiefs, looking to end a two-game skid Monday night at New England. You can bet on how Palko fares against the Pats. Here are his ‘over/under’ totals: passing yards 235.5 (both -115), TD passes 1.5 (‘under’ -175 favorite), interceptions .5 (‘over’ -200 favorite) and completions 20.5 (both -115). 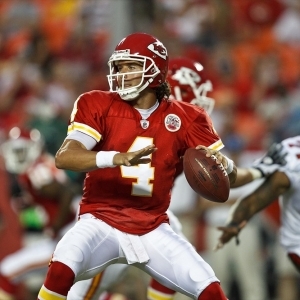 The 28-year-old lefty Palko has thrown all of 13 passes in regular-season action since coming into the NFL in 2007. Six of those came Sunday after Cassel went down and Palko, a former University of Pittsburgh QB who also played in the CFL, Arena League and UFL (he was actually cut in that league), went 5-for-7 for 47 yards. The good news for Palko is that he faces the NFL’s No. 32 pass defense in terms of yards allowed. New England, which could be missing top cornerback Devin McCourty, is No. 21 in TD passes allowed with 15 and tied for eighth in interceptions with 12. Frankly, I like ‘over’ in every prop. The Chiefs are going to get behind quickly on Monday night and Palko should rack up the numbers against a soft New England defense that probably will be playing prevent by the mid-third quarter. Look for something like 22-for-40 for 252 yards with two TDs and two INTs. Finally, let’s look at two NFC East head coaches who are squarely on the hot seat and whether they will be coaching their teams for Game 1 of the 2012 season: Philadelphia’s Andy Reid and Washington’s Mike Shanahan. ‘Yes,’ Reid will be back next year is at Even with ‘no’ at -140. Shanahan is ‘yes’ at -200 and ‘no’ at +150. Fans, media and even former players have said it’s time for Reid to go with the Eagles the NFL’s biggest disappointment at 3-6. I find it hard to believe that Philadelphia lets Reid go, however. This guy did lead the team to nine playoff appearances and five NFC title games in his first 12 seasons. Reid has a good relationship with team owner Jeffrey Lurie and Eagles president Joe Banner. What I think the Eagles do is make Reid re-make his coaching staff (defensive coordinator Juan Castillo for sure will lose that gig). Look for Reid to be back unless he refuses, which I doubt. Shanahan shouldn’t be back. This guy has been living off of John Elway for more than a decade. Shanahan can’t find a quarterback in Washington, going from Donovan McNabb – who cost the Skins plenty in trade – to Rex Grossman to John Beck back to Grossman. After a 3-1 start, Washington has lost five straight games. Its offense ranks among the NFL’s worst. The problem is that Shanahan has some $21 million left on his contract after this season. Even Dan Snyder would be loath to eat that money. I expect Snyder to pull player personnel authority from Shanahan but allow him one more season to turn things around --- and groom a quarterback, as the Skins no doubt will take one in the first round of the 2012 draft (can you say Matt Barkley? Or maybe even trade for Peyton Manning? ).